Traffic Sign Confusion – A Measure of Disrespect Towards People on Bicycles? Parking? No Parking? And where do vulnerable road users ride? Last week, I was riding my bicycle eastbound on Northpoint Drive approaching Michigan Ave when I observed the pictured pair of traffic signs. I have to admit that I found this signage quite confusing for a couple of reasons. The most obvious ambiguity is the juxtaposition of a No Parking sign just below a seemingly contradictory sign on the same pole indicating that the right lane is designated for parking. As the picture below indicates, the sign is situated just before an intersection where paint marks three lanes. In the absence of signage, I would expect a road user to consider these a left-turn lane, a straight-ahead lane, and a straight/right turn option lane. Confusing sign is at the right – what do bicycles keep left of? That the sign tells bicycles to somehow be to the left is very confusing – what region are people on bicycles supposed to stay left of? Most people on bicycles would not feel comfortable going straight from the center lane because many motor vehicles to the right will also head straight across requiring an awkward and dangerous merge. There is no other sign like the top one along this stretch of Northpoint. This is not the last of some series of identical signs – it simply stands alone. Although this sign sits west of the intersection, I have a feeling that it is supposed to govern behavior beyond the intersection to the east. (There are no like signs on that side of the intersection either.) But there is nothing posted indicating such, meaning that the signs direct traffic how to behave at this location. From the perspective of someone driving a motor vehicle, the ambiguity of these signs is unlikely to cause any stress. Such a person will likely proceed as if the signs weren’t there at all. But from the perspective of someone riding a bicycle, this confusing signage is a bit troubling. Those riding bicycles are always aware of their vulnerability. People on bicycles expect the traffic environment to give clear indication of how the roadway is designed for use. If there are specific indications for how bicycle traffic should proceed, such signage or markings should be unambiguously clear. Where confusing signage requires someone on a bicycle to require extra assessment of the traffic infrastructure to identify both what their legal obligation is and what a safe path to take is, this risks a distraction from the traffic situation around them. At this particular intersection that ordinarily has some challenges for people on bicycles, the danger of such a distraction is amplified. 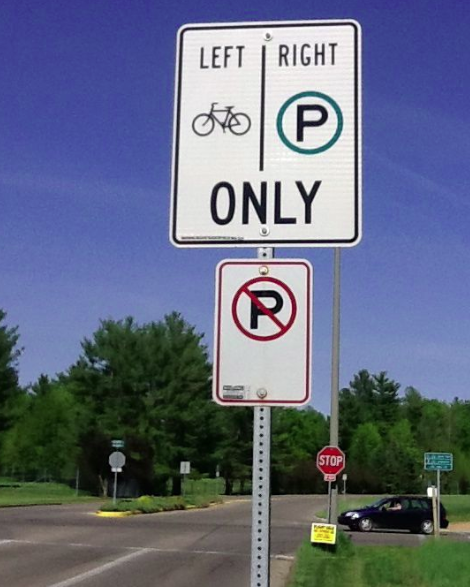 In my opinion, the creation of additional danger for people riding bicycles because of this confusing set of signs demonstrates a level of disrespect towards those choosing bicycles for transportation. I would guess that some sort of human error was made in posting this set of signage at this location. 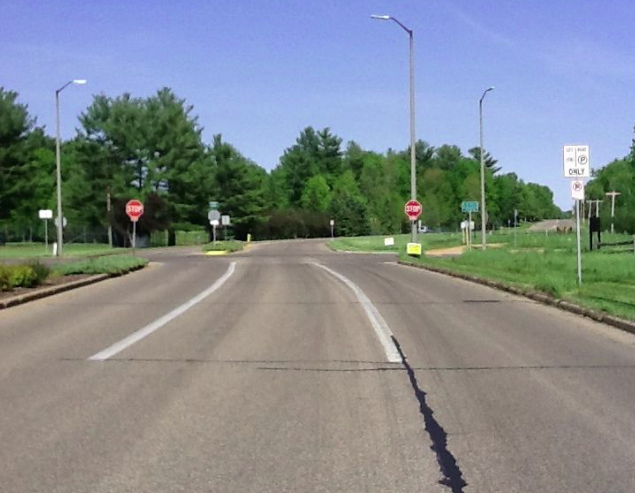 I hope the Stevens Point Department of Public Works, who I believe is responsible for this signage, will provide some explanation of what the actual intent of this signage is and will soon act to create a set of signage that clearly tells all road users how they are expected to use this road.